We've just spent several days improving the accessibility of the Downtime Monkey website. Last week we carried out an audit of the site with Google's new tool web.dev, which is currently in beta. The tool returned high scores for three of the four aspects that were tested: performance (i.e. website speed), best practices and SEO (i.e. optimisation for search engines). This was no surprise as we'd focused heavily on best practice and SEO when developing the site and in January we undertook a very thorough performance audit where we reduced page load time by more than half. However, the accessibility score was just 48%, so there was plenty of room for improvement. Side note: all of the pages with embedded YouTube videos showed reduced performance scores. This has previously been covered in-depth in this post on improving page speed. "Web accessibility is the inclusive practice of ensuring there are no barriers that prevent interaction with, or access to websites, by people with disabilities. When sites are correctly designed, developed and edited, generally all users have equal access to information and functionality." In practice, this (mostly!) means ensuring that screen-reader software can access and interact with all the content that is in place on a website. The web is possibly the modern world's greatest tool and good accessibility means that more people have access to this brilliant tool and all the benefits that come from it. If your website is inaccessible you are losing some users, which means that you are losing customers. Improving accessibility is very straightforward, and we've provided full details of the optimisations that we made so that you can apply them to your own website. Our starting point was a website that had already been developed with accessibility in mind but had never been thoroughly tested. Testing with web.dev is easy. Simply input the URL of the webpage that you want to test and hit 'run audit'. The results include an overall score and a list of recommendations for each of the 4 categories. Here we're only concerned with the accessibility category. Following the recommendations is straightforward but it is time consuming as every page on a website must be tested and corrected individually. This is because improving accessibility is about making all content visible to screen-readers. It is easy to forget to add an 'alt tag' to an image or an 'input label' to a form field, and a few omissions can drastically reduce the accessibility of your website. The error: "Image elements do not have [alt] attributes". All images must have an 'alt tag' in place. This should consist of a few words that describe the picture so that a screen-reader can read out a description of the image. The error: "Form elements do not have associated labels". Most input fields should have an associated 'label' so that screen-readers can read out a description of the input field, letting the user know what to input into the field. Note that labels are not required for hidden inputs, buttons or 'submit' inputs. Sometimes an input field is self-explanatory for sighted users. One example from Downtime Monkey is the 'select your country' dropdown menu - it's obvious from the design of the site that the user needs to select their country. Adding a visible label here would actually decrease user experience. But screen-readers can't read the design of the site! The solution is to add a label that is visible to screen-readers but not shown on-screen. This is best done by creating a CSS class for 'screen-readers-only' and applying that to the label. When creating the CSS class it is important not to use 'display: none' or 'visibility: hidden' because screen-readers skip content that is hidden like this. The error: "Links do not have a discernible name". Sometimes images are used as links - a common example is a logo that links to the home page of a website. This poses a problem for screen-reader users as they cannot see the image and no text is in place. The error: "frame or iframe elements do not have a title". The cause of this error was embedded YouTube videos and it was something that we had missed completely. Embed code supplied by a YouTube video comes without a title. Unfortunately this means that screen-reader users can't tell what the video is about or even that the iframe contains a video! The error: "user-scalable='no' is used in the meta name='viewport' element or the maximum-scale attribute is less than 5". We have spent a lot of time ensuring that the website worked well across all screen-sizes from tiny phones to large widescreens. Part of this was making sure that the text is sized appropriately for the screen that it is shown on. So it was really annoying when some phones (we're looking at you iphone!) override this, apply their own zoom and muck-up the beautiful text sizing! To prevent this we had used 'user-scalable=no' so that the correct text sizes were seen on iphones. Unfortunately a side-effect of this was that everyone was prevented from zooming - so partially-sited users who need larger text would be unable to zoom. Sometimes when an icon is clicked a form is submitted. A common example is when a 'trash icon' is used to submit a form which deletes something. This makes for a great user-experience for sighted users but there's no text present for a screen-reader to read. In this case there is no error from web.dev because icons only need to be labelled under certain circumstances. When an icon is present purely to add style there is no need to add a label. 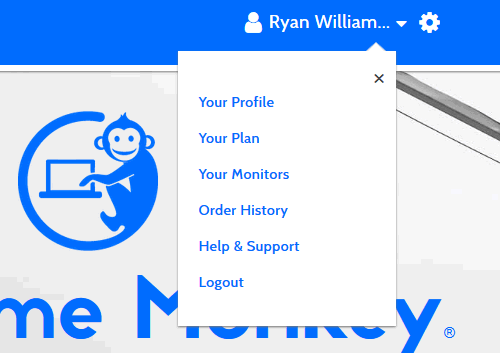 For example, on Downtime Monkey when a user's list of monitors is displayed, every website that is up has a tick icon shown beside the word "UP". No extra information is provided by the icon so there is no need for a label. However, when an icon provides additional information it is important to use an 'Aria Label' so that a screen-reader can provide the information to its user. An example, again from the user's list of website monitors, is that the bell icon is shown when email alerts for a specific monitor are turned 'on' and the bell-slash icon is shown when email alerts are turned 'off'. Sometimes an icon is used as a link. For example, a PDF icon is linked to a receipt document in a user's 'order history' so they can easily view and print their order details. However, screen-readers need text to provide the context of the link. Again, adding an 'Aria Label' to the link solves this problem. In this case no error was caught by web.dev, however accessibility improvements were made. In Downtime Monkey, modals are used as an alternative to dropdown menus because they provide better user experience. The image below shows the modal that is used to display the 'user menu'. Note that in the top right corner of the modal there is an 'x' which can be clicked on to close the modal. This x is a span that acts as a button and this is potentially confusing for screen-reader users as it doesn't provide context for the link. The error: "Background and foreground colors do not have a sufficient contrast ratio". Low-contrast text can be difficult to read for partially sited users and high-contrast text is recommended to make text easier to read for everyone. Most of the text on the site passed, but some blue, green and orange text failed. However, implementing new colours is a big job. Simply upping the contrast of the current colours considerably reduced the user experience for most people. The high contrast text was either really bright (so bright that it hurt) or very dark (dark enough that it made it hard to distinguish between small headings and paragraph text). It became evident that introducing high-contrast colours would involve redesigning the site. We thought long and hard about this and in the end it was decided that the benefits of keeping the colour scheme outweighed the disadvantages, although we may revisit this in the future when we have more time to spend on redesign. Running the test after making the changes provides a check to ensure that fixes have been applied correctly.